In the ancient Roman myth, flora was the symbolization of the wisdom, beauty, and love. From April 28th to May 3rd every year, the traditional flora festival was held in Italy. In these six days, people were experiencing all kinds of joyful activities and decorating themselves with roses or their beloved animals. In people’s mind, flora was a symbol of happiness. Titian’s Flora targeted at the hypocrisy of asceticism in the Middle Ages, praised the beauty of female body, and repeated this eternal theme in the work again and again. 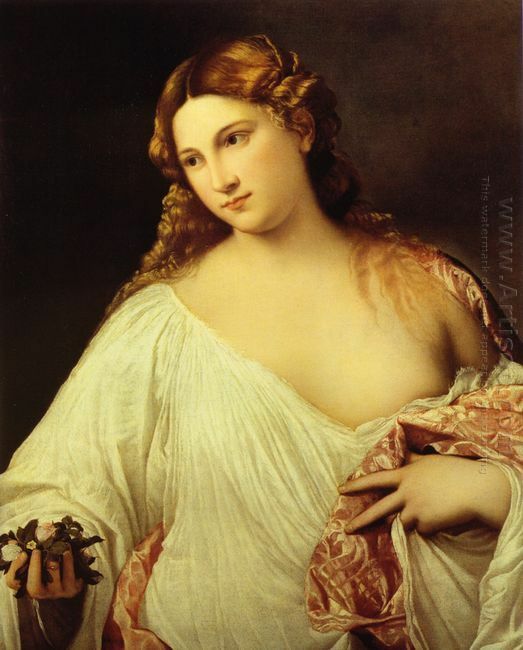 In accordance with the aesthetic point of view of the Renaissance, Titian depicted the flora virgin. Like the early bud, her eyes flashed the reserved glory. But her body was as mature as that of a lady to meet the people’s general appreciation. Titian’s work was not as rigorous and quiet as Leonardo da Vinci in the composition and atmosphere, not as reserved and gentle as Raphael in the characters, not as painful and angered as Michelangelo. He was good at outlining the characters based on the brown background, rubbed out the hidden soft notes by hand, making the character float out with the color, like Botticelli’s Birth of Venus. Before this, no one dared to boldly depict the completely secular women who were full of vitality. If saying Michelangelo was the giant of using nudes who dignified to the church, then Titian was using the mature naked human bodies to express the confidence of the emerging bourgeoisie from the point of hedonism.